✔️IMMEDIATE ACCESS TO YOUR BABY - Our special double zipper at the top of the net means you avoid the hassle of having to untie and remove the whole net in the dark to reach your child quickly in the night, or having to reattach the net once your child is settled. 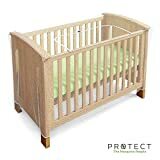 The unique zip access also means the net can remain in place over the cot bed for as long as you need it. ✔️ PROTECTS AGAINST MOSQUITOES AND OTHER INSECTS- The net material is a strong barrier against insects and mosquitoes, the fine net mesh preventing them entering your baby's cot. The transparent mesh also means you can see your child at all times. ✔️FREE TRAVEL BAG - The durable drawstring net bag provides an excellent storage option and helps protect the net against damage when not in use. The net packs away easily into the 24cm x 17cm bag making it incredibly simple to store or pack for holidays or travel. No need to bother folding the net - just stuff it in and tighten the cord!